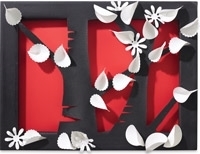 How can a flat piece of paper become a 3-dimensional relief sculpture with only one fold? The answer lies in multiple layers! Students use math skills to create contour shapes that recede in space and then expand again, while learning about a popular contemporary artist. Easily teach the concept of a horizon line while making a beautiful symmetrical pressed landscape. 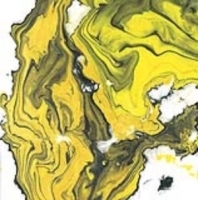 Fold paper in half, then transfer paints and pigments in a method similar to the Rorschach prints. After printing, add detail using markers. The process is customizable based on age. 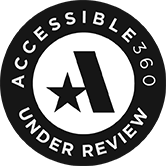 Just press for younger students, or add sophisticated details at older ages. Use inks and alcohol to create interactive diffused patterns on paper. Bright inks and common rubbing alcohol work together to create surprising results! Experiment with dark over light, or light over dark. Try applying alcohol with tools such as brush handles, by dripping, or with an atomizer bottle. Use this technique in compositions or as a way to make decorative papers for other uses. Loy Krathong is the Festival of the Floating Lotus, celebrated in Thailand and other nations. Create a floating artwork with markers, colored pencils or paint on waterproof Mineral Paper, fold it and float it! Make a natural notan landscape with the help of vibrantly colored and patterned papers! In Japan, "Notan" is the term used to express the visualization of light and dark as an element of design. Add color, patterns and a landscape format, and something truly unique is created! 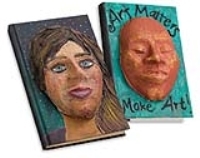 Make an up-close-and-personal sketchbook or journal cover by creating a "face book" out of a cast and painted high relief face. Use quick mache to cast a face mold, then add modeling paste to customize the face. Create a realistic self-portrait, or morph the face into an animal or alien being! Finish with acrylic paint. Use a fun, traditional bookmaking technique to make pastepaper, then cut and tear pieces to make a modern mosaic! Pastepaper is made by pulling rubber combs and tools through paint that has been mixed with rice paste to create interesting patterns and designs. After the pieces are glued in place, pouring medium gives the whole piece the look of a glazed mosaic! Henri Matisse survived cancer to find a renewed energy and expressionism in artworks he called “scissor paintings.” Inspired by his cut-paper shapes, students can use sunlight or an artificial source to create color-saturated prints on fabric or paper. Many artists have used trees as an inspiration for their work. 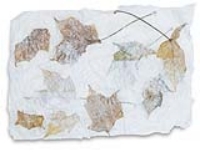 Pressed leaves and texture tools are used to make one-of-a-kind, double-sided monoprints. Using a flexible printing block as a plate makes it easy! Experiment with Japanese paper-dyeing techniques using traditional rice papers, then share papers to create simple origami kimonos. The result is a stunning combination of art and culture. For over 1000 years, the quill was the principle writing tool in the Western world. Imagine the stories, poems and sketches that can be made with a hybrid quill and dip pen designed to be a work of art in itself! A variation on Japanese Origami, Kirigami is created by folding paper and cutting portions away. This surprisingly uncomplicated relief sculpture is assembled with “rings” cut from double-sided sheets of colorful cardstock. The edges of the rings are folded, cut, unfolded, and layered concentrically (placed around the same center point) to make modern-day Kirigami designs. Paper engineering meets the principles of design! This procces breaks pop-up designs into three very basic techniques - spirals, zig-zags, and boxes - and focuses on design elements: color, form, shape, and space. A simple hinging technique using the ever-popular, colorfully patterned DuckTape allows the book to open and lie flat for the most eye-popping and paper-popping look! 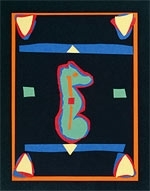 Stain painting was a successful technique employed by Color Field artists Helen Frankenthaler and Morris Louis. They poured diluted acrylic color over large canvases to form “veils” of brilliant color. In this lesson, students will first learn a simple process for creating their own drawing pad, then stain and design a canvas cover for it. Printmaking — starring textures and shapes! A collagraph printing plate is created on a canvas panel using textures found in the classroom, textured gel mediums, or even textures from nature! After a final coat of gel medium is applied, the plate and paper are run through a printing press. 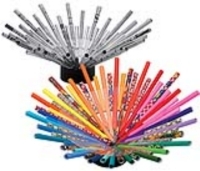 Quilling is also known as paper filligree, paper rolling, mosaic or paper folding (even though the paper is really curled). 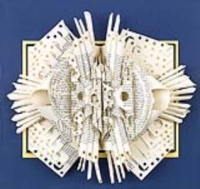 In this project, students will try their hand at quilling in a truly sculptural way. By using much larger, thicker strips of paper, the finished product "pops" out in a very optical way. By using black on white, the effect is even further emphasized. Unlock the secrets of an ancient Egyptian pyramid with this easy-to-construct box that opens to reveal “treasure” inside. When closed, the outside walls are held in place with a clay disk. Remove the disk and open the pyramid to reveal what's inside. Younger students can make artifacts from clay to place inside. 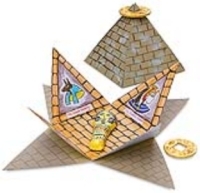 Older students may be challenged to learn the inner parts of the pyramids and add paper pages to write about and illustrate their discoveries. A few simple geometry skills and a little time spent making paper rolls is all that goes into this eye-catching art paper bowl. It's a great way to recycle materials or use up scrap paper, and your students will learn about repeating patterns and design rhythm as they place each tube of paper on a piece of self-adhesive film. 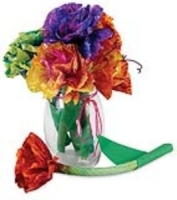 The easiest way to make colorful, three-dimensional paper flowers! Even young children will enjoy painting carnation-like blooms and creating full bouquets for Mother’s Day gifts, May Day celebrations, a Cinco de Mayo fiesta or a Hawaiian Luau. Each flower costs just pennies to make. Because the watercolors blend together and form new hues, painting each bloom is a good way to illustrate color mixing. There's more to "deconstructing" a book than just altering the pages. In this project, deconstructing means changing the object from a book to a sculpture. The tools are very basic — scissors, glue, paper punches and a desire to experiment! The magic is in the color! Wax Pastels adhere to the slick surface of tooling foil and stay there. 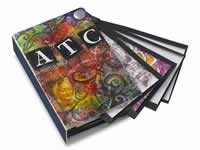 Students explore tools and texture plates to create designs in lightweight metal, then, using simple page-binding techniques, assemble a lovely hardcover book to use for notes, sketches, journaling, scrapbooking or photos. Rather than traditional pages, the interior of these “books” will hold objects collected by students. 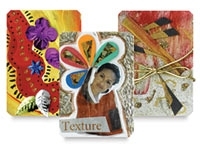 An “art box” book could contain samples of texture, color, form, and line or other examples of design elements or styles. Or a more personalized box “about me” could hold a collection of tiny photos, poems and small keepsakes. From the outside, this Storybook Theater looks like a simply constructed book, but open it and a puppet stage unfolds! 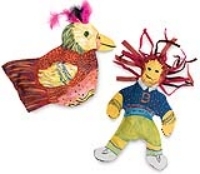 Children make their favorite stories come to life with puppets, props and scenery. There's even built-in pockets for holding craft stick puppets. This is a great project for teaching recycling and renewal. Using a plastic stencil and screen, students make a shaped piece of handmade paper from cast-off scraps. Flower and vegetable seeds are added to the pulp. 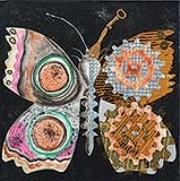 When dry, the rough-textured paper can be decorated with paint or drawing materials and glued to the front of a card. When planting season arrives, place the shape in the soil to make a beautiful garden. This lesson plan is designed to celebrate fine artists by honoring them with a "commemorative stamp." This project also introduces students to philately, the study and collection of stamps. During World War II, President Franklin Roosevelt delivered a State of the Union speech in which he spoke of four basic freedoms he dreamed of being available to everyone in the world. Artist Norman Rockwell interpreted these freedoms in a series of popular paintings published by the Saturday Evening Post in 1943. This lesson plan challenges students to consider the concept of freedom: what it meant to a president, an artist and what it means to them today. Exercise for art is as important as exercise for sports or rehearsal for theatre, as it fosters a continual pursuit of excellence. 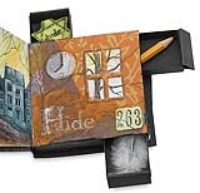 In this lesson, to exercise their artistic creativity, students keep a day-by-day art journal. Each page should be a simple statement of a different idea or small thought for the day. Suminagashi is a process in which Sumi ink is floated on the surface of plain water, then transferred to a sheet of paper. Each monoprint is like a fingerprint — unique and unreproducible. This project is a simple, tidy way to create the look of pulp painting without the mess of a blender or even the use of adhesive. Non-bleeding tissue paper is combined with water and agitated (torn) so that the paper fibers separate and make a rough pulp. Pressing the paper onto an absorbent (canvas) surface causes the fibers to re-bond with one another and, when dry, form a thicker, stronger paper. 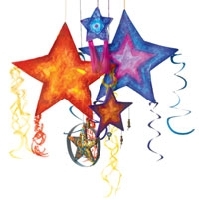 In the Philippines, during the Festival of Lights, parol (puh-roll), or star-shaped lanterns, symbolize the victory of light over darkness as well as hope and goodwill. These simple parol are created with natural reed, translucent rice paper and liquid watercolor. 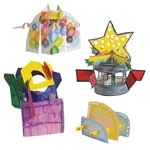 Displayed in a window or hanging from a light fixture, they make colorful, festive decorations for any season. This lesson plan is inspired by the brightly colored pottery of Mexico. 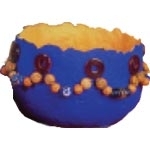 This simple papier mâché version casts paper pulp into a textured bowl using an existing plastic or ceramic bowl as a mold. "Toro Nagashi", the Japanese Festival of Floating Lanterns is a beautiful event involving floating paper lanterns. Using YUPO paper and multiple mediums, students make lanterns for indoor or outdoor use. Great for special occasions and gifts, these thought-filled boxes are created by bringing together two art forms: Calligraphy, which means “beautiful writing” and Origami, which translates as “folded paper”. 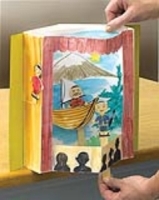 This simple bookmaking project can achieve great results with a wide variety of ages. Using nature as a theme, it's a perfect place to record nature sketches, foliage collections and personal observations of the world around us. 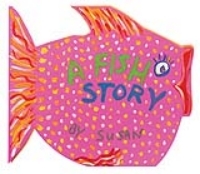 Design a “big” storybook.Children can write the story and choose something in the story to be the book cover. The Story Paper can be cut to the shape of the book cover. An easy bookmaking lesson that works across the entire curriculum. 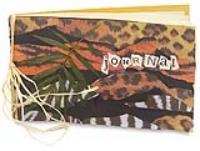 Students make books to use as journals or scrapbooks and fill with personnel stories or poetry, sketches or photos. 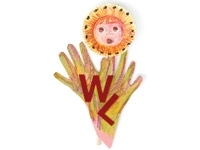 Gathering flowers, leaves, fiber, ribbons and newspapers can expand children’s awareness of their environment. Results are awesome! 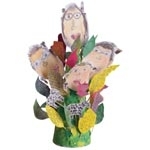 Make printmaking papers, cards, book covers, picture frames and photo mats. Use two pieces of construction paper, scissors, and glue to explore pattern and repetition. A simple lesson to explore the basic concepts of weaving. 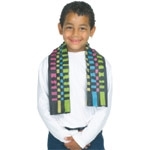 Introduce students to Pop-Art while creating fun, colorful ties. This page offers a few suggestions for creative art projects that support mathematical instruction on chart and graph reading. Minimal resources, great results! This lesson promotes an awareness of shape and space. Kente is the name for the beautifully colored, traditional woven fabric of West Africa. Like most African art forms, Kente expresses more than just visual appeal — it represents history, status, religion and social values. 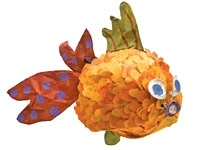 This interactive torn-paper collage creates pockets for watercolor fish to swim in and may be linked to the study of pond life (science) and Japanese culture. 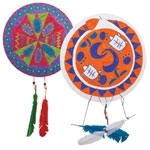 Teach students about the unique symbolism of Native American culture while they learn valuable design and drawing skills. 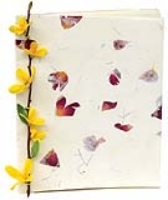 Children will create their own journals, sketchbooks, or scrapbooks with this project. Every child is a flower! Their self portraits are fun and make a beautiful garden in the classroom. Oil pastels and wiggly eyes brighten the flowers. 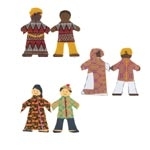 These paper dolls are wonderful to combine with the Global Village Paper. They can easily be turned into old-fashioned paper dolls, displayed in chains and hung. Or create a globe and arrange dolls around the total outside edge. 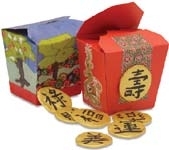 This lesson plan celebrates the Chinese tradition of passing along good fortune or "Fu" to others. Children have many family members and pets and friends who are "honorary" family. Have students discuss their family and describe how they look. 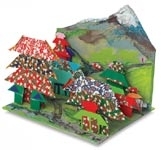 Teach your students how to make paper with this project. 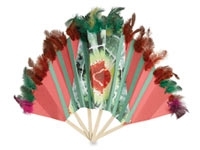 Listed are colorful samples of simple fans. Discuss the importance of fans and how they were used to keep people comfortable for years. These papier mâché dishes are an example of utilitarian items that can also be used as décor. There is a rich history in dollmaking techniques throughout the centuries. 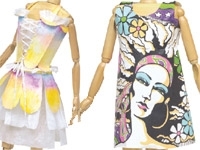 These soft dolls are painted, stuffed and glued together — so the construction is easy and safe. Japanese homes have interior walls that are actually large, movable screens constructed of thin wooden strips and very strong paper — allowing light to shine through. In this lesson plan, three small Shoji screens are created to hang on a wall or stand upright on the floor. Introduce students to calligraphy, ink, folding and dyeing techniques. The end result is a beautiful banner they will be proud to hang up! This book-making and collage project uses small matchboxes as drawers to tuck away secrets, supporting a variety of literary and historical studies, such as “The Hiding Place” (Anne Frank) or the Underground Railroad. 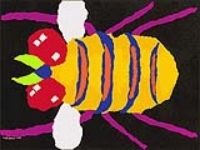 This lesson plan encourages students to explore shape and color by creating original and whimsical insects from brightly-colored, torn paper. 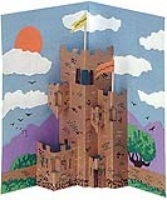 Students will learn how each of the architectural elements of a castle was designed for the purpose of protection and design their own fortress by making a “pop-out” from construction paper. Even young students can achieve beautiful results — without the use of chemicals or special materials. Transform the process of collage! This collage method encourages greater self expression by incorporating descriptive words written on black chalk paper. After imagery is glued to graph paper, it's cut apart into numbered strips and reassembled onto chalk paper. Finally, using colored chalk, the artist is able to add words to imagery. Gear stencils are the hub of a mixed media piece centered in the Steampunk movement. 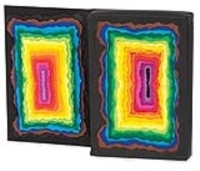 Using brightly colored felts, paint applied by squeezing rather than brushing, and folding of the fabric to repeat pattern, a vibrant and very individual statement is made on a functional and useful piece of artwork – the book cover. An upcycled paperback book serves as the basis for a lesson in form. Using french curves, a template of a Greek pottery form is made. 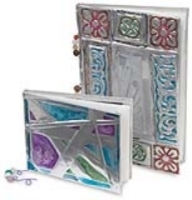 Trace the template onto a book, cut the pages, and open the book to reveal a 3-D piece of paper pottery! Glue the Vase to a painted or collaged background for something truly unique. A twist on the tunnel book, this in-depth poetry presentation stars repurposed transparent CD cases. Students learn how artists create visual depth in art while designing a book that illustrates an eight-line poem they have selected or written. Create an ancient "carving" using cast paper and blasa foam! Transform a single line of text into a dimensional work of art! 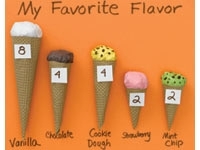 This project should be considered “Part Two” of our Fiber Fusion lesson plan. 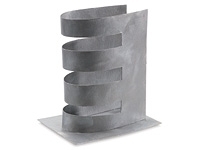 This project helps students stretch their imaginations and further develop a |two-dimensional artwork they’ve created by turning it into a three-dimensional sculptural piece. Students will define a purpose for creating a functional work of art and identify its effectiveness and unique characteristics within a certain cultural and social setting. A single, simple origami pattern is used to make multiple buildings. Students study perspective and structure of a village. 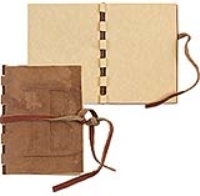 Students recognize that a handmade book is a work of art in itself. 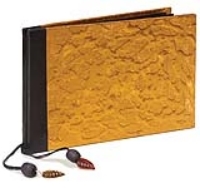 The molten-metal texture on the cover provides a rich presentation for the personal treasures that will be written inside. The black pages are a dramatic background for words rendered in metallic marker, gel pen, opaque colored pencils or opaque ink. For greetings, gifts or just for fun, students will enjoy making a pop-up card with a lovely folded water lily tucked inside. 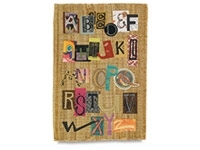 Alphabet samplers were popular during the 19th century and were embroidered on linen or canvas. 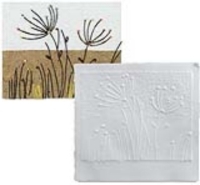 This lesson plan celebrates the unique qualities of paper available for artists with a version of the sampler made with paper and art techniques. Similar to the Positive and Negative Space activity, this lesson will let the children's imaginations run wild. In order to understand Minimal Art, students must recognize what is absent. 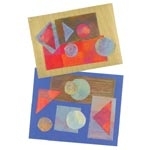 These painted chipboard constructions are abstract with a minimum amount of color, value, shape and texture. Students learn an easy and economical form of metal working. Using The Golden Door as a theme to search for historical and aesthetic content, students create a paper collage containing relevant images, text and expressions. This project requires students to work with the same issues confronted by professional sculptors, working in the round, the work being understandable to the viewer, and structural stability. 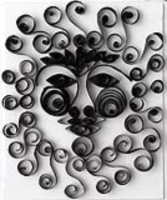 In this lesson, students cut papers into silhouette forms. The unity of shapes stress the principles and elements of design. Handmade paper is beautiful in itself. If you add dimension and shape, it becomes a work of art. 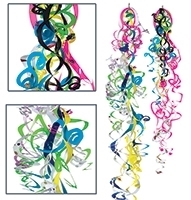 Students create a dimensional line drawing out of flexible wire then cover it with assorted papers and tissues for a whimsical, lightweight sculpture. This simply-constructed book holds up to 20 Artist’s Trading Cards without drilling them or gluing them. 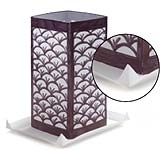 Folded paper sleeves hold the cards in place as they rotate or “twist” out into a fan for display. Cards slide easily in and out of the sleeves when needed. 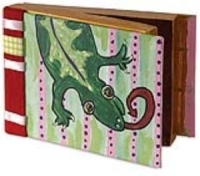 Collage, stamp, paint, draw or decorate the matboard cover in any manner to make it personal and unique. This project is about drawing a realistic representation in order to practice your observation skills. 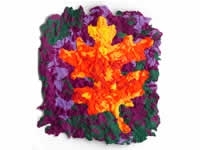 Students will learn to construct a relief sculpture using the elements and principles of art and paper construction techniques. This project combines creating designs and then altering them through the use of light.